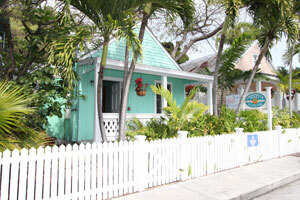 Courtney's Place Key West Historic Cottages & Inns! Come stay in Key West like a Native - Our exclusive guest cottages, efficiencies & private rooms are situated off a quiet lane in the heart of the historic district of Old Key West. The guest quarters accommodations at Courtney's Place Key West Historic Cottages & Inns all have been created out of Key West cottages and homes well over 100 years old. We happen to be on the highest point on the Island-18ft. above sea level. Our Key West neighborhood is one of authenticity and has seen little change over the last 50 years – it is made up of some of the original descendants of the Island – Conchs, Bahamians, Dogs, Cats, Birds. Legend has it that years ago during Key West’s heyday as a shipwrecking town, pirates would come up to this area and bury their gold and treasures that were stolen from the cargo ships that lay wrecked on the Atlantic coral reefs. Several years ago one of our neighbors, while digging a swimming pool, found $10,000 in gold coins (No shovels, please!). History tells us our little lane was once called “Cat Alley”, in the early 50’s it was renamed Whitmarsh Lane after Mary Whitmarsh, one of Hemmingway’s best friends. In fact, she owned one of our cottages. 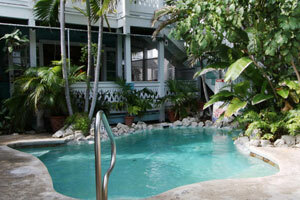 Courtney’s Place Key West Historic Cottages & Inns is located 150 miles south of Miami and 90 miles NW of Havana, Cuba. We are situated 1 1/2 blocks north of the World Famous Duval Street – 7 blocks from the Atlantic Ocean and 7 blocks from the Gulf of Mexico and 4 blocks from Hemingway’s home. So we are just minutes from all the attractions-beaches, fishing, snorkeling, diving, museums, shopping, live theater and restaurants. You can walk; bike or even try a moped. Our Key West units are nestled among a tropical garden and small pool - all have been totally renovated to give you all the amenities of home, but we’ve kept the charm that history has brought to this tiny Island. Our Key West accommodations are cozy, clean and cool – they all have private entrances, so you won’t be tip toeing here. 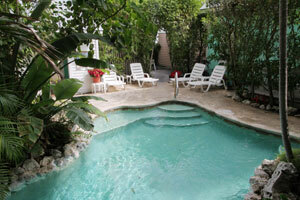 Courtney’s Place Key West Historic Cottages & Inns consists of 8 cottages, 3 efficiencies, and 7 private rooms. Care has been taken to furnish and decorate each unit warmly and in a way that makes you feel at home. We try to make your stay in Key West as enjoyable and comfortable as possible. Staff is considered family and has lived on the Island for a number of years, some of us even born here. Our goal is to be as accommodating as possible. We are People Friendly, Children Friendly, Pet Friendly – we’re just plan FRIENDLY and we Welcome All! Linda and Chuck Krumel built Courtney’s Place Key West Historic Cottages & Inns as a legacy to their daughter Courtney who now owns and operates it with the help from family. Linda came to Key West on vacation, from the cold north – Linda an art major from New York and Chuck a mass communications major and musician from Virginia, fell in love first with this Island and both migrated here some 30 years ago. Then we fell in love with each other in the early 70’s. 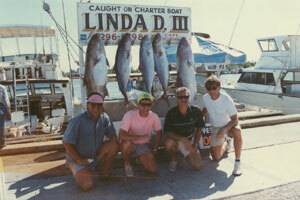 The 70’s were the “Hey Day” of our era in Key West; the Island had not been totally discovered by the world yet. It was a haven for Artist, Writers, Smugglers, Shrimpers, Hippies, Gays and Corruption – houses were selling for a few thousand dollars each. We got our master degrees in renovating conch houses and working at Capt. Tony’s Saloon. Linda ran the Saloon and Chuck was a singer/songwriter. We partied with the best: Tennessee Williams, Jimmy Buffett, Tom McGuane, Capt. Tony, Chris Gantry, Susan Nadler, Viola Veidt, Margaret Foresman - just to name a few. Along came the 80’s and Courtney was born – career change - there was “NO” place to buy clothes for her, so we opened a children's department store “A World for Children” on Duval Street. 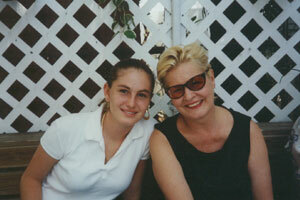 During the late 80’s Key West was really making big changes from a Fishing Village to a Tourist Destination, a close friend of ours from the 70’s, Shel Silverstein, suggested we open a Guesthouse with a restaurant – he loved Linda’s cooking. – Courtney’s Place was borne As a family we try to spend a couple of months a year in the Thousand Islands – in our renovated old boathouse. So if you have decided to come to Old Key West and you want to explore this great Island full of History, let us be your guide. Maybe you just want to relax, read a novel, hang out at the beach, or try a little deep sea fishing, scuba diving, snorkeling, sailing, or just indulge in great seafood, or are you feeling a bit more adventurous - want to find your own treasure ship? Better yet - Become one of Key West Famous Characters – “Please” - come stay with us at Courtney’s Place.